Kaiserbagh, Lucknow [General view taken from the tomb of Saadat Ali]. 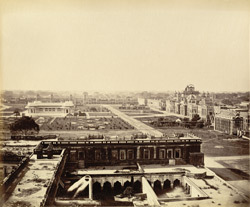 bl.uk > Online Gallery Home	> Online exhibitions	> Asia, Pacific and Africa Collections	> Kaiserbagh, Lucknow [General view taken from the tomb of Saadat Ali]. This photograph by John Edward Saché (1870s) is from the Lee-Warner Collection 'Bombay Presidency' album. The Kaiserbagh palace was built by Nawab Wajid Ali Shah between 1848 and 1850. His vision for the complex was of a paradise on earth with large gardens which would be an ideal setting for dance, drama and poetry readings. It was also intended to be a showcase of the riches of the royal court. Pathways through the various courtyards of the garden were intended to be indirect and zigzag to confuse visitors. This lack of clarity, together with guards posted at the numerous gates also helped to maintain a strict security within the palace. The great gateway leading into the complex was decorated with gilt crowns, Mughal-style pavilions, and European-style statues. The façade displays a stucco decoration in the form of large fish, an ancient symbol of sovereignty that had been associated with the Nawabs (Muslim rulers) of Lucknow for over a century.